Available only at The Container Store, our Elfa Gliding Shoe Rack is an innovative way to store shoes with heels. Supported by two Elfa 16" Ventilated Shelf Brackets, it glides out for easy access to your shoes. Glide it back into position to conserve on space. It can be mounted on Easy Hang, freestanding or Mounted Standards. White Elfa Gliding Shoe Racks is rated 4.6 out of 5 by 57. Rated 5 out of 5 by Tamme from LOVE them! Before I got these, I was wearing the same 5 pairs over and over because I couldn't see or remember what I really had. Since I've installed these, I have worn shoes that I hadn't worn forever! Rated 5 out of 5 by CCinSF from My favorite closet feature This is a must-have for people who have a sizable collection of high-heeled shoes. Not only are all your shoes well organized and within easy reach, but if you're a shoe lover like I am, it's a way to systematically display your collection. Despite having as many shoes as I do, I still have room on the racks. It's a fantastic space saver and I highly recommend it! Rated 4 out of 5 by cynik from Excellent Solution! I struggled with shoe storage until I came across this awesome product. The quality is great - smooth operation and sturdy. Installation was easy and I am not handy at all. Easily holds 9 pairs of heels in a very small space. I don't seem to have the issue that others have, probably because my shoes are small (size 6 1/2) - the higher heels just clear the toes of the shoes behind them. I highly recommend this item if you have smaller feet - either way, just put the highest heels in the back row or stagger them and it should be fine. Rated 2 out of 5 by annnnnnnnnnnnnnn from Don't get al the great reviews If you have many pumps with heels over 2" this is a very frustrating shoe rack. All my pumps are between 3 & 4 inches high. It's not a coincidence that in all the online photos the rack will not show heels in front of the other. If you have high heels, the heel of the shoes you have in the front will lie right on top of the toes of the shoe behind it and scuff and stain them. You have to line up the shoes so that they are not right behind each other, meaning you have to skip the middle section entirely or pace the shoes in a zig zag fashion. This means that instead of 9 pairs of shoes you'll probably be able to get away with placing only 6 pairs to avoid scuffing and damaging shoes. Also be careful with the last row of the rack because if you slide the rack forward and back the heels will get hit with the back metal bar and could scuff or damage the heel. It's just not very high heel friendly. Rated 5 out of 5 by Hawksnst from Amazing-my closet got bigger and mornings faster! I was pretty skeptical of the elfa closet system at first. In fact, I was a little skeptical of an idea of a store that sells stuff to keep our stuff in...felt like it was a little too much consumerism. Once I went in and took a look at the elfa systems, I was all in. The quality of all of the products are top notch. The salesperson even gave me some ideas about how to mix in pieces meant for other uses into my master closet that would provide great options. I could not be happier. And when they tell you that installation is easy--it really is. I had my husband help me line up and anchor the top pieces, and I did the rest. It was actually a fun project. I looked at closet systems that would have cost a couple thousand dollars more. This looks great, has a number of finish options and does the job. And the components are really high quality. What more could you ask for? I'm totally sold. In particular, the Gliding Shoe Racks are a dream. Initially, I thought I'd go cheap to start with and add them in later. But I am SO GLAD I built them in to the system quickly. They were easy to install, and they really hold the shoes securely. Leave a little extra space between shoe racks if you happen to have exceptionally tall shoes, otherwise the upper shelf can bump the shoes on the shelf below it. Or just put your tallest shoes on the top shelf. Now that I'm not digging under beds for shoes, or searching the bottom of the closet under hanging clothes, I've actually gained a few extra precious moments of my mornings. And my once-cramped closet now has room to spare! Here's a little extra endorsement. I bought a lot of pieces. The only piece that came in with a little concealed damage was one of the shoe racks. I contacted customer service through their convenient chat option, and explained that the store is a little far away from me. They immediately offered to replace the defective item, sight unseen, delivered right to me. That kind of service just is so rare today. There are very few brands out there that manage to inspire the kind of loyalty that Elfa and the Container Store are doing. They also do something called conscious capitalism, which means they give back to the communities where they have stores. They gave to a number of charities in the area here, and that makes me feel even better about my purchase. I'm a fan for life. Thanks for reading! Rated 5 out of 5 by Liviwall from Absolutely love this product! I have 6 racks and it is perfect for organizing and showcasing. Rated 5 out of 5 by ZonaLisa from Shoe Hoarder Approves! 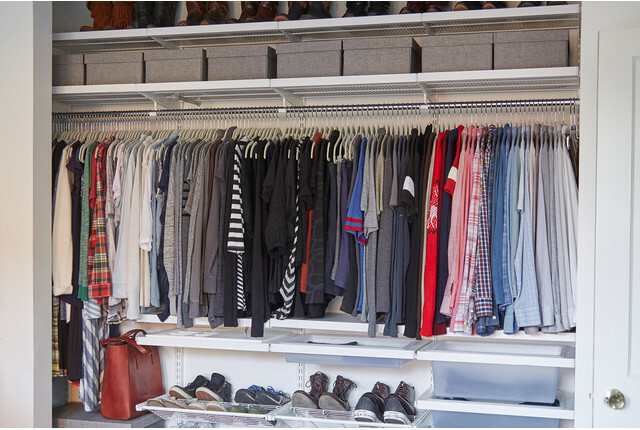 With far too many shoes in my closet that I believe to be beautiful or know to be useful, I am always looking for a better way to maximize storage. THIS IS IT! I get 9 pair of shoes on one level where I could only get three before. In addition, I can stack the next level closer together because the unit slides out! I thought it might be a little unstable, holding that many shoes. WRONG! It is remarkably stable, even when fully extended. WELL DONE, CONTAINER STORE! This is my favorite product! Rated 5 out of 5 by issyheartsELFA from keep your heels, head and standards high! I love my gliding show rack......I can store my heels in the most attractive way, saving space at the same time! I heart ELFA! Rated 5 out of 5 by CraftieTerry from Best closet shoe organizer out there!!! I installed many of these in my closet. The elfa organizer, which holds 9 pairs of heels in the width of 3 pairs, is the best one out there, hands down. I was unable to find any other organizer from any company that could store as many pairs in as little space. If you have a LOT of shoes, this is the organizer for you. It pulls out so you can access the shoes in the back. I've had mine for over a year and I have not had any issues or problems. The quality is great and they look good in my closet. Installation of the Elfa system is also very easy. I also like how it is modular so I can always change it if my needs change. 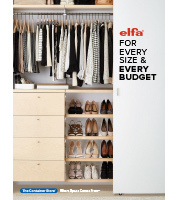 You cannot go wrong with this product or other other Elfa closet organizers. Rated 4 out of 5 by JenSp from Great Product - Awesome service! Bought this during the Elfa sale. Love it - so useful and actually holds a good amount of shoes. 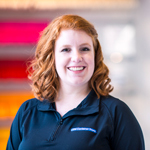 The staff was really helpful during my consultation and helped me pick out exactly what I needed! Rated 5 out of 5 by Jaybkickabee from Walk-in Success Getting my shoes off the ground was so helpful in freeing up space in my new walk-in. This made it so easy! Rated 5 out of 5 by RedWingShopper from Best Shoe organizer This is the best solution I have seen to organize shoes and be able to see them. Works well. Rated 4 out of 5 by kikiann from White elfa Gliding Shoe Rack Easy to install, however I am glad I read earlier reviews as I wouldn't have known about the double click! Would recommend to anyone who needs shoe racks! Rated 5 out of 5 by onetree from No more shoes in the floor! I cannot believe what a difference this makes to my closet! Not only are my shoes not in the floor, they are organized by color on a pull-out shelf! I love it! Rated 5 out of 5 by ShoeDiva from Love the glide of the rack, The glide of the rack allows me just view my shoes without effort. Rated 5 out of 5 by Belladee from Shoe Happy Anything that allows me to see all of my shoes at a glace is fantastic. And the fact the racks glide for easy access to shoes, make it even better. These are great! So are the racks for flats. Rated 5 out of 5 by shelleybellybutton from awesome shoe storage solution finally a way to store my high heels so i can see them easily. the rack holds a ton of shoes and is incredibly easy to install. Rated 5 out of 5 by misorganized from Wonderful Upgrade to current system Love the new shoe racks, in fact replaced 5 of the older, non-sliding verions with 2 racks for flats and 2 for heels. makes finding all my shoes easy!! Rated 4 out of 5 by NewCondoOwner from Holds heeled shoes very well. This is a great feature, and I have found that the shoes stay on the bars solidly when pulling the slide in or out. My only issue is that it takes a little extra effort to place the shoes on the level the furthest back. Sometimes I bump the other shoes in the middle row and they fall down. Rated 5 out of 5 by nm24 from Best Use of Space Elfa has the only gliding shoe rack I found that allows me to store six pairs of shoes, instead of three on each rack. It's the best use of space, and allows me to view all of my shoes with ease. I would definitely recommend this product and have. Rated 5 out of 5 by Anonymous from Genius! incredibly functional. A great way to utilize all the space we have (which is limited). Rated 5 out of 5 by CraftyJ from A TRUE MUST HAVE!! 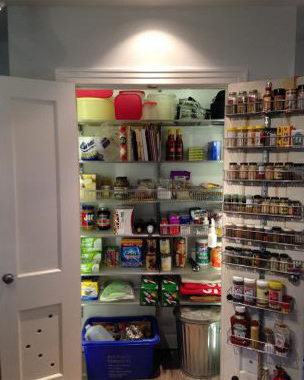 I’ve purchased Elfa closet systems for 3 homes now and I keep coming back. This gliding shoe rack is a prime driving for my repeat purchases! Since installing these racks (I have 4 of them) I can easily see and access all of my heels. It also serves to keep them in better shape (not piled in the bottom of the closet) and reduces repurchasing similar shoes because I’d forgotten them at the bottom of the pile! Rated 5 out of 5 by Mmoe from My granddaughter's bedroom is beautiful with Elfa design . My walking closet is a joy, took pictures and sent them to my sister in Barbados. The gliding shoe rack: a love. Rated 5 out of 5 by sbt121 from Best Shoe Storage & Display The entire elfa system is so simple and efficient to install and utilize.. but my favorite piece is the Gliding Shoe Rack! I'm a major shoe lover, and the best part is I can not only organize my shoes, but have them on display so I can see them neat and pretty every time I go to the closet. 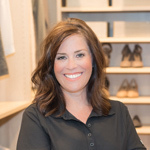 I have over 40 pairs of shoes, and the GSR has helped me enjoy the shoes even more with being organized, reducing space used, off the floor and out of their boxes. Rated 5 out of 5 by Nickybird from white elfa gliding shelf rack I love these sliding shoe racks, it holds up to 9 pairs of high heel shoes, I bought 2 but I always can buy another if I decide I need more shoe storage.They slide out so you can view and select your shoes. I love how elfa is so easy to add and remove componets. so you can change the design based on your needs. I now have my dream closet. Rated 4 out of 5 by SausalitoFamily from Essential for Heels Other pull-out drawers simply don't work with women's heels -- this is the must-have! I use this for 9 pair of heels, and two of the standard shoe drawers for flats, wedges, and sneakers. The perfect combination. Only downside is that the drawer is a bit tricky to put in and installed it's a little wobbly - not 100% perfect. Rated 4 out of 5 by geishake from space saver! sliding shoe rack maximizes space...I'm able to fit 9 pairs of heels on one rack. It's built sturdy as well. My only complaint is that the frame that allows the rack to slide does not catch it so you have to really be careful from pulling it out too far. This is true for any of the sliding shelves or drawers for Elfa. They may sell a component that will address this issue. Overall a great product. Rated 5 out of 5 by YuviEli from The best shoe rack you'll every meet..! It's truly a genius rack ~ extremely easy to install and ergonomically designed. I used 4 different shoe racks before being introduced to this one. It allows you to see exactly what shoes you have with a little back and forth sliding ~ making it easy to choose what you're going to wear. With the old shoe racks many shoes used to get unnoticed squished or fall when I tried to get one pair out. Now I wear all my shoes and they're always intact. The racks are a bit expensive so I'm buying little by little until I get my entire closet done. It's a great investment. I know if I move, I'm taking them with me. They can be easily moved. Does the white elfa gliding shoe rack come in widths less than 24&quot;? No, that's the most narrow. Can I place these side by side? In all of the photos I've seen, everyone is stacking these vertically, can I place them side by side? I will need many units, and this is the only way I'll be able to fit them all. Yes, only the small tabs on the sides go into the shelf holders, so you can definitely place these side by side. How much clearance do I need between each of these? It depends on the height of your shoe. If you have taller shoes, you need a little more space, or else the shelf above it can catch. Plan on 6&quot; between and you should be good. do these accommodate flats or wedges? I see only pictures of heels. Do these hold flats and wedges also? No - you would need an actual heel to hook on to the bar. The Elfa Gliding Shoe Shelves work for flats or wedges, though. Are the brackets sold separately? Yes, this requires two elfa 16&quot; Ventilated Shelf Brackets and they can be found by selecting the product recommendation link below. How much space do you have to leave between these shoe racks? or more specifically how many spaces on the standard do you need in between the shoe glide and another shoe glide or shelf? We recommend 8''-10'' between each shoe rack and shoe shelf. As Kristen and Marc Montoya were making room for their twin babies (see their precious nursery here), they were also making room in their quirky master closet.